"The Roy and Helen Hall Memorial Library, located at 101 East Hunt St. in downtown McKinney, offers a collection of more than 150,000 items. This library houses extensive fiction, nonfiction, reference and children's materials. IN ADDITION, IT ALSO OFFERS THE HELEN GIBBARD HALL GENEALOGY AND LOCAL HISTORY AREA. For obituary information, visit the library's Genealogy area on the second floor in the Reference section. If you live outside of Collin County, you may request obituary information via email from Susan Kusterbeck. Please include the person's name and date of death. "The first Dallas Public Library opened downtown in 1901 with help from Andrew Carnegie. The current facility, named in honor of former mayor J. Erik Jonsson, opened in 1982 and features eight stories." The Dallas Public Library Genealogy Section contains one of the largest and most comprehensive collections for family history research in the Southwest. Over 50,000 individuals visit annually, with many traveling from out of the state to utilize the collection which includes all states and counties of the United States. Resources for many foreign countries are also available. 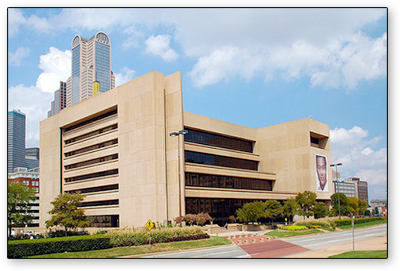 "The DGS holds meetings throughout the year, usually at the J. Erik Jonsson public library in downtown Dallas. General Meetings are held on the first Saturday of each month (September through May). These consist of a social gathering before hand, a short business meeting followed by an educational presentation. We have several active Special Interest Groups on a variety of topics: African American, Jewish, Brown Bag(general research topics), MacGen Reunion, DNA and a Technology group. In addition, we host three Seminars throughout the year, featuring nationally recognized speakers. We cap off the year with an awards banquet where we recognize individuals and organizations that have made significant contributions to support the goals of the society." All events are scheduled on our calendar of events. We hope to see you at an meeting soon!" General meetings are open to the public and are held the first Saturday of each month at the J. Erik Jonsson Central Library starting at 10:30am. There are no meetings scheduled in June, July, and August. The National Archives at Fort Worth is a center for historical and genealogical resources. Please Note: On September 25, 2015, the National Archives at Fort Worth's research and training rooms at 2600 West 7th Street, Fort Worth, TX 76107 (Montgomery Plaza) closed, and relocated to 1400 John Burgess Drive, Fort Worth, TX 76140. Our new microfilm research room at our John Burgess location (1400 John Burgess Drive, Fort Worth, 76140) opened on on October 1, 2015. This move allows us to consolidate our staff and resources that will result in even greater customer service. Our hours will remain the same: Monday -Friday from 8 a.m. - 4 p.m. (except for federal holidays). "Our facility is for Archival as well as Microfilm research. We also have Public Access Computers. Our historical records housed date from the early 1800s to the late 1900s, and include letters, photographs, maps, architectural drawings, and other documents received from over 100 Federal agencies and courts in Arkansas, Louisiana, Oklahoma, and Texas."